Midwood: There’s not much to look at on the Midwood stretch of Coney Island Avenue. But that doesn’t stop the denizens of Nitecaps from periodically emerging from their drinking den to take a gander at the four-lane traffic and un-beautiful industrial landscape. Once back inside, they have to wait another ten minutes for their eyes to adjust. 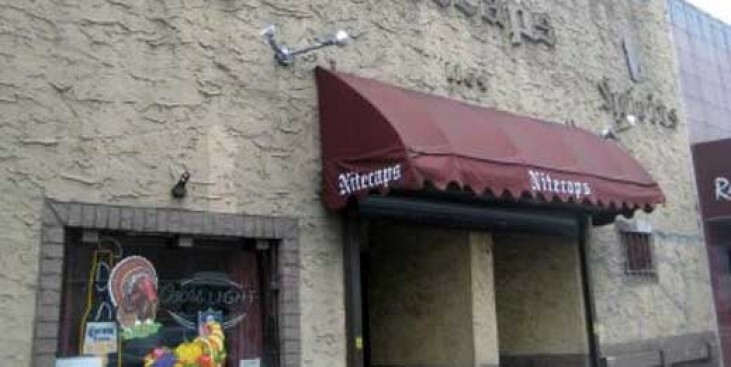 For Nitecaps, which is near Avenue H, is a dark bar. Dark like a cave. Dark like a mineshift. Wait a while and your eyes slowly begin to discern shapes of things you didn’t know were there. There, in the corner: an old metal coat rack. On a shelf below it: forgotten piles of New York phone books. Behind the bar: a small fish tank housing a solitary fish. And there, tucked in a space to the right of the door: two neatly kept dart boards, with just enough space in front of them to hold a game. A strange face is likely to get a friendly grilling here. One imagines few people other than extreme locals and dart lovers seek out the protecting walls of Nitecaps. Then again, who knows? After Coney Island Avenue shuts down for the night, this lonely bar is about the only game in town, darts or no.